Whip the butter in a mixture until creamy. Add masa harina and water and mix until completely combined. 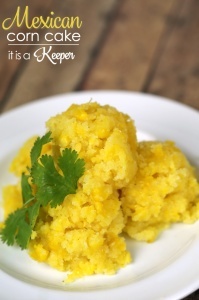 Place the thawed corn in a food processor and pulse a few times. You want some of the corn to be roughly chopped while leaving some kernels whole. Add the chopped corn and cornmeal to the mixer and combine. In a separate bowl whisk together the sugar, cream, salt and baking powder. Pour this mixture into the corn mixture and mix thoroughly. Spread the mixture evenly in an 8"x8" baking dish. Cover tightly with aluminum foil and place into a 9"x13" baking dish. Pour about 3 cups of water into the larger baking dish, to create a water bath. Bake for 50-60 minutes or until the corn cake is cooked through. Remove from the oven and take the smaller dish out of the larger one. Let the corn cake cool for 10 minutes before serving.